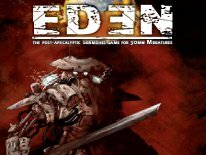 There's a wide variety of alternatives to GamesWorkshop products when it comes to Sci-Fi miniatures in 28mm scale these days. I did some looking around to try and find some that really stood out, because I didn't want to cover just any old sci-fi figures. 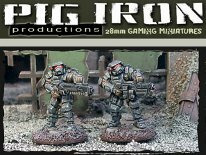 Pig Iron Productions are one of the few makers that I found, who really had some nice looking alternative pieces. To get a feel for their products I had them send along some of their System Troops Basic Infantry, and the Kolony Militia Missile Teams sets. The System Troops Basic Infantry is a five figure set. Each figure is a single piece cast, with separate head, and backpack sprues. 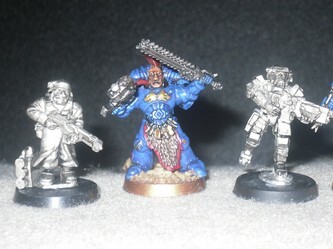 Three of the sculpts are the same, and the fourth and fifth are a charging forward pose on one leg. One is moving forward on the right leg, the other charges on the left leg. The helmets really remind me of a cross between the classic PC shooter DOOM and Quake marine helmets, and the Imperial Storm Troopers/Kashrkin Guard from Warhammer 40k. The rest of the armor overall looks very reminiscent of the Imperial Storm Troopers/Kashrkin Guard as well. However, the backpacks are nothing to write home about. The weapons I do like, and they look really nice. I almost want to say that I like this design more than the standard space marine bolter in 40k even. It's a beefy rifle, and it looks like its good for killing things, so there's not much more to ask for in a weapon. The mold lines clean up fairly well, so there's not a lot of clean up effort needed. My only gripe is that they have a small base that's part of the figure, so you do need to buy round bases for the figures separately. The tiny bases that are molded into the figures themselves don't help them stand very well, especially the more dynamic running and leaning forward posed ones. However, in their defense, on every page of their online store, they make this perfectly clear by stating that "bases are not included". Scale-wise they claim 28mm scale, and I'd have to say that's about right. I don't have any Imperial Guard figures handy for comparison, as I only play Marines and Space Wolves now, but next to a power armored Space Wolf they're a little on the small side. However, keep in mind, power armor adds some beef to the model, so these are probably right on the money, because the IG Kashrkin are thinner than any power armored figures as well. The Kolony Militia Missile Teams is a four figure set. Two are standing, and two are kneeling. One of the standing figures is holding a bazooka/missile launcher, as is one of the kneeling ones. 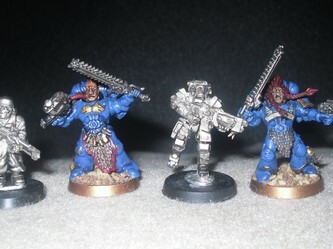 The other two standing, and kneeling figures are holding what appears to be a power rifle of some sort, which could easily be called a bolter, plasma gun, pretty much what ever you want it to be, it looks sci-fi and cool enough. Maybe not quite as beefy in comparison to the weapons the System Troopers offered, but none the less it's a nicely sculpted sci-fi rifle. 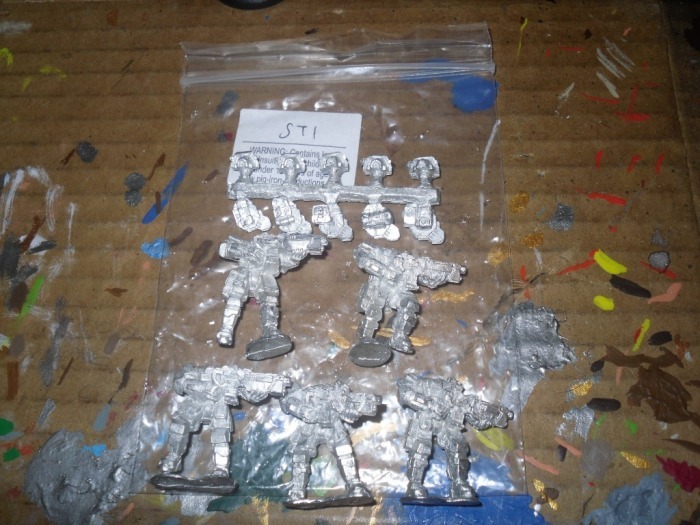 Like the System Troopers, these too are single piece castings, with separate head sprues, which also came with a small third sprue with two big missile launcher ammo boxes to be no doubt carried, or set on the base of the non-missile launcher holding figures. The helmets are really nice, they feature a the German WWII-looking helmet, complete with gas masks, giving them that Imperial Guard Steel Legion look overall. 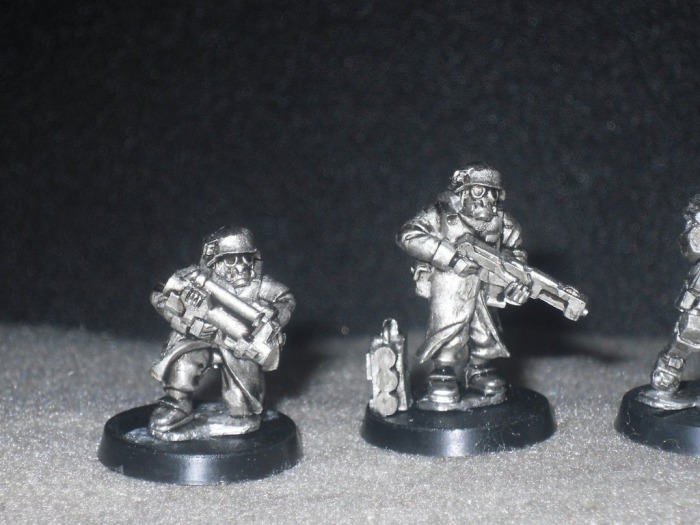 The bodies are adorned with greatcoats too, and when combined with the helmet/mask combo, they look a lot like excellent stand ins for most any Imperial Guard players' army. Also like the System Troopers, these too require separate bases, because two of these figures won't even stand on their own with the tiny bases molded onto the figures' feet. These are some of the better figures that you can find out there, in terms of alternative options for say a Warhammer 40k Imperial Guard army. 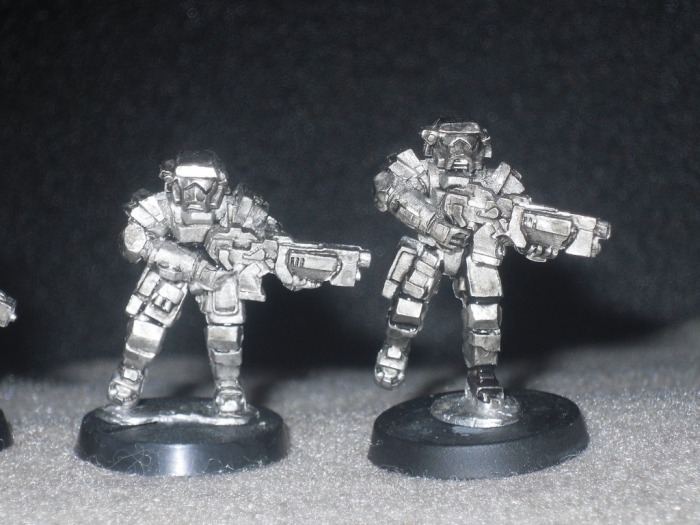 I'm sure that you could use these in most any other 28mm sci-fi game too, but realistically, at a glance anyone can see the bold similarities to the Imperial Guard found only in Warhammer 40k here. The System Troopers can also double for Storm Troopers in a Demonhunters themed army quite well too. Considering GW no longer offers the Storm Troopers boxed set... these are really one of the only options to pursue for Demonhunters. Granted GW Direct does offer the old Storm Trooper models in groups of 4 figures at a time, but it's not cost effective. As for the sculpts, I can't say they're stellar or mind blowing, but they do look the part, and don't look bad by any means. I seam to prefer the System Troopers more than the Kolony Militia, mostly because the Kolony Militia guys are just a soldier in a greatcoat wearing a German helmet and a gas mask. They certainly look cool, but I've always been more of a fan of the armorclad troops. They're not over the top in terms of the poses either. Assembly is no big deal, since these are mostly single piece castings, and very little glue is needed as well, just a drop to pop the heads and backpacks on and you're ready to go. Just be certain to have some bases ready, because these don't come with bases, and you'll need them. I can't really call this a gripe, but it's more a fact and a warning...These did come with a sticker on the packaging detailing that these figures do contain lead. So don't let your kids grab them to run off too chew on any of these things, it can be deadly. Although, I must admit... I am yet to hear of any horror stories where some kid died from sucking on and ingesting any old D&D or Ral Partha figures from the old days, when almost all of these figures were pretty much made of pure lead. Nonetheless, it's something I felt I should point out. There are a variety of other System Trooper and Kolony figures from Pig Iron Productions too, including Special Weapons for System Troopers, and two other Special Operations teams and a basic Troops option for the Kolony Militia. There's also Kolony Rebels and Kolony Ferals as well, which are different sculpts altogether. You definitely want to check out their website to see all of what they have going on. Pig Iron even make larger robots and vehicles too. If I did my calculations right, these figures are 8 British pounds per set, which equals about $12.35 each in US Dollars, which is very reasonable for all metal figures, and still less than the cost of the actual GamesWorkshop counterparts to boot. 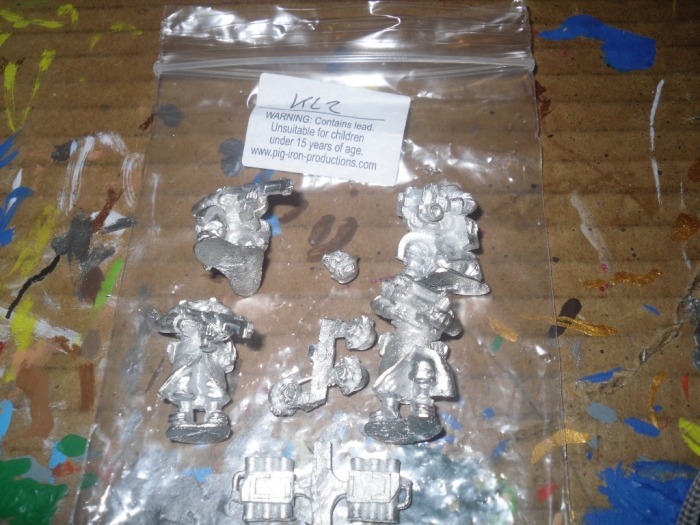 Economically, they're a wise alternative option to GamesWorkshop's products. At present GamesWorkshop charges $17 for four of the old Storm Trooper figures, so to get a 10-man squad, they screw you into buying 12 figures at a cost of $17 for every 4, which equals $51. For $34 you can get two 5-man Pig Iron Productions System Troopers sets. It's something to think about.